Total time: approx. 2hrs 45mn. You’re recipes are keeping me busy. My husband made a list for me this year which includes, the bear paw cookies, the crescent cookies, kolace and the Christmas bread. I made the dough for the cookies yesterday–they’re in the frig. Now I’m fascinated with the kisses. If I don’t get to them before Christmas, I’ll make them for New Years. Love, love your videos and your wonderful food. Merry Christmas to you and to Steve. Thank you Karen! 🙂 That means a lot to us. Best of luck on the recipes. 🙂 Wishing you wonderful Christmas and all the best in new year! 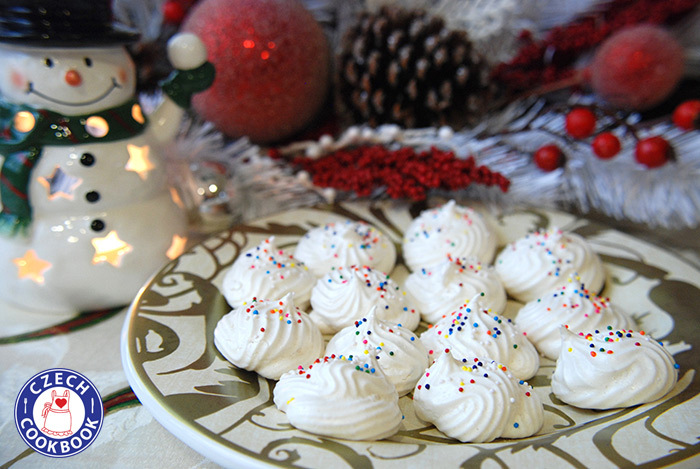 My deceased father’s sisters baked those every Christmas; they were delicious! jsem cesky by jiny father’s heritage z Bohemia. Trying to do research on his family’s heritage. Dekuji! Nashledanou! Are meringues a “recent” Czech thing or were the Bohemian people making them in the past? Or is an “everyone” thing? HAHA I was wondering because I was trying to get in touch with my Bohemian roots by baking some of the traditional Bohemian foods. All I know is that we made it as long I remember. Other Czech families too. But not sure how far this goes.